On August 21, the Department of Energy (DOE) announced the dates of three public hearings to be held in Nevada this September. The purpose of the hearings is to give members of the public an opportunity to comment on the upcoming recommendation of Yucca Mountain, currently the only site under consideration for a national repository for high-level nuclear waste. Coinciding with the announcement of the hearings was the release of a new report, titled the Yucca Mountain Preliminary Site Suitability Evaluation (PSSE), which assesses how a repository at Yucca Mountain would perform in light of new radiation standards that were finalized in June. Before Secretary Abraham can make his final recommendation on Yucca Mountain to the president, he is required to consider comments made by the public. Mandated by the Nuclear Waste Policy Act, public comments are an indispensable part of the process of approving and licensing such a facility. Citizens’ opinions on “technical, policy, or other issues related to the possible recommendation” are being solicited by DOE – it is important that those who could be affected by the construction and operation of a repository at Yucca Mountain voice their concerns. Comments can be given verbally at one of the scheduled hearings in Las Vegas, Amargosa Valley, and Pahrump. Written comments can be mailed to both DOE and Secretary of Energy Spencer Abraham, who will make the final recommendation to President Bush. DOE is also accepting comments by fax and e-mail (see below for details). All comments must be received no later than October 19. While the PSSE offers no conclusions on the suitability of the site, DOE’s findings show that a repository at Yucca Mountain would perform well within the health and safety standards set earlier this year by the Environmental Protection Agency (EPA). The final radiation standards allow for no more than 15 millirems a year for people living beyond 11 miles of the repository. The rule also includes a separate 4 millirem limit for groundwater. DOE believes that the largest expected dose a person could receive from the repository in the first 10,000 years would not be more than 0.1 millirem, even in the worst-case disruptive scenario. The report also concludes that the amount of radiation released into the groundwater would fall below the limit stipulated by the EPA. In addition, the report states that a Yucca Mountain repository would perform as designed regardless of volcanic activity, earthquakes, or undetected flaws in the metal canisters that will hold the highly radioactive nuclear waste. Step 1: Perform site characterization activities. The NWPA requires DOE to perform scientific studies at Yucca Mountain to provide specific information for evaluating the suitability of the site for a repository. Since 1986 scientists have carried out this plan by performing specific in-depth analyses of the area's geology, hydrology, chemistry, and climate. Step 2: Develop a preliminary repository design. Using the results from these studies, engineers are developing a preliminary design for a repository that would safely isolate highly radioactive waste for more than 10,000 years. The repository design includes man-made barriers to complement and work with Yucca Mountain's specific climate and geology to provide additional protection against the movement of radioactive materials into the environment. Step 3: Prepare an environmental impact statement. The NWPA requires DOE to prepare an environmental impact statement for constructing, operating and monitoring, and eventually closing a repository. In 1999, DOE issued for public comment its Draft Environmental Impact Statement. The EIS provides information to help policy-makers and the public understand the potential impacts of the proposed repository on people and the environment. DOE will not respond to the public's comments and publish a final environmental impact statement until site recommendation. Step 4: Conduct public hearings. The NWPA requires the department to conduct public hearings in the vicinity of the Yucca Mountain site to inform residents of the area that the site is being considered for a possible recommendation for development of a repository and to receive their comments. DOE appears to be interpreting “vicinity” to be within 100 miles of Yucca Mountain, which excludes most Nevada counties affected by transportation. any impact report submitted by the state of Nevada. If, after recommendation by the secretary, the president considers Yucca Mountain a suitable location for a repository, the president would recommend the site to Congress. According to the NWPA, the governor and legislature of Nevada would then have 60 days to submit a notice of disapproval. Congress then has the option to propose and pass a joint resolution for repository siting approval within the first 90 calendar days of continuous congressional session after receiving the notice of disapproval. If Congress acts within this specified time and the joint resolution becomes law, the site would be approved. If the Yucca Mountain site is approved for development, DOE must submit a license application to the Nuclear Regulatory Commission within 90 days to obtain authorization to construct a repository. Mining: Could a rail route interfere with future mineral development? Current mining activities? 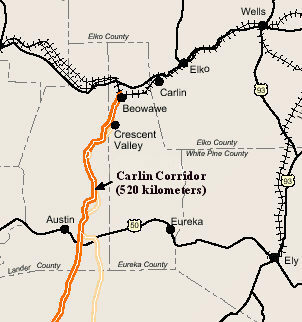 There are 92 patented mining claims in Eureka County within 10 miles of the proposed Carlin rail corridor. History and Culture: Would a rail line disrupt archeological sites, sacred Indian grounds, and other places of historical and cultural value? There are at least 21 archeological sites along the Carlin rail corridor in Eureka County, including Maiden’s Grave and Gravelly Ford. Environmental Justice: Will a rail route in Central Nevada affect some communities more than others? Could minorities like the Western Shoshones be the recipients of more adverse impacts than the rest of the population? Property/Land Use: Who owns the land that the proposed railroad would run through? About 55% of the land in the Eureka County portion of the corridor is private land. Railroad: Would the impacts of a rail line be different if it was used to ship things other than nuclear waste? Who will own and operate the railroad during nuclear waste shipments and after the shipments of radioactive waste stop? Will DOE ship low-level nuclear waste to the Nevada Test Site on the rail spur?